Nick Clegg (1986) talks to Bin Brook about his life and work. 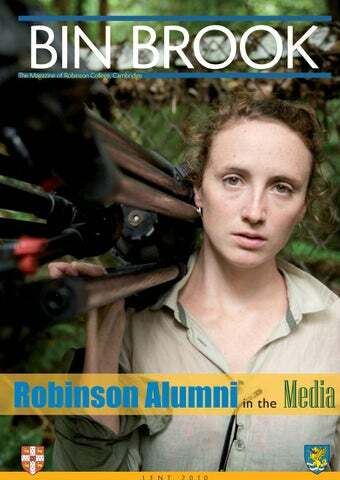 Conserving Media - cover story Evie Wright and Nick Lyon (both 1998) talk about their colourful careers in conservation filming. A look at the fine art and photography of Robinson’s Ben Cole (2005). A note from the editor Professor Trevor Page’s article in the Michaelmas 2009 edition of Bin Brook was well received by everyone and gave a fascinating insight into the early days of the buildings and people that make up the College. It has been noted by Izi Metzstein, however, that the design of the chapel was actually the work of Gillespie, Kidd and Coia, and not John Piper as was reported in the article and he points out that they were designers of churches, rather than restorers. Further information about the Chapel can be found at http://www.robinson. cam.ac.uk/chapel/. The Mighty Maintenance Bin Brook talks to the Maintenance team about the hidden work that keeps the fabric of the College together. Editor: Mr Gregoire Hodder Committee: Dr Stephen Trudgill, Dr Ros Love, Dr Judy Weiss, Ms Helen Cornish, Mrs Helen Winter and Mr Gregoire Hodder. Front cover photograph: Evie Wright (1998) from films4.org. See page 8. In the eye of the media Nick Clegg (1986), Robinson’s first major political party leader, talks to Bin Brook about his time at Robinson and his views on the forthcoming general election. Clapham Junction and on down to Romsey. Most importantly, my life is very much about my family and my small children, I am completely besotted by them. So my time is very much family and then a lot of travelling around the country. I am not a natural Westminster politician. I find that a lot of the archaic Alice in Wonderland ritual in the House of Commons is, quite frankly, ridiculous. I think it is increasingly a clapped-out place in need of reform, so I spend as much time as I can getting out and about in the real Britain in all of its diversity. I hugely enjoy my constituency work and will be up in Sheffield tomorrow doing my usual constituency surgery. all their time in Westminster, is increasingly looking like a little bubble world that doesnâ&#x20AC;&#x2122;t really have anything to do with the real world out there. It does seem that politics needs to be more relevant to the people and that using media and new technologies could make politics tactile and accessible. I agree, and that is one of the reasons why I have my Facebook page, I tweet and I have completely revamped my website to make it more interactive. That is also why I am on my way to hold a public meeting in Eastbourne. Every single week I hold a public meeting in different parts of the country that I advertise locally. Anyone can turn up and ask any questions that they like because I think that there is a longing to return to a face-to face politics, rather than this self-obsessed bubble in which a lot of Westminster politics is conducted. Nick Clegg talking to pupils at the Sacred Heart School during a French lesson. of that had a thought-provoking effect on me, but it didn’t at that stage make me think that I wanted to become an MP. The link was never direct at that stage. I was very interested in what was going on around me and, as I said before, I was quite angry about what I saw Thatcher doing to Britain at the time, so I left Cambridge open to further political influences. I didn’t come out of university fully formed in my political views, far from it; it took several years and working elsewhere for that really to happen. I have to say that, in hindsight, I am immensely grateful for it because, whilst I am relatively young as a leader at 43, I actually started active politics really quite late. I didn’t do it at university after which I went on to do two postgraduate degrees, I then worked in London, I worked in Hungary, I then worked in the European Union for 10 years before I became an MP. All of those things that happened in the decade/decade-anda-half after university were incredibly important, I think, in giving me a perspective before I finally took the plunge. it wasn’t that I was immersed in College activities, but I had a very strong circle of friends from College, some of whom I have retained. I played in the College tennis team, which I enjoyed hugely and I did a lot of acting. A lot of am dram stuff, some of it in the College, a lot of it outside. I remember being in a play directed by Sam Mendez. Little did I know that he was going to become a great phenomenon later. So I had a very happy time and I was lucky in a sense that I was able to balance time inside the College with time outside the College. My first impression of Cambridge that I remember was the first evening I arrived in September and biking down Burrell’s Walk and it was very warm, there were lots of mosquitoes about, but I could not believe it and my breath was literally taken away by how beautiful it was and what an amazing freedom it felt just to be able to bicycle in 2 minutes flat from my room into one of the most beautiful university towns in the world. It really did take my breath away. It seems to be a special role that Cambridge University has in opening people’s minds, rather than forcing them down a certain route. I still get that sometimes walking down Burrell’s Walk. One of the other things that I am most grateful for about my time at Robinson is that I made some incredibly close friendships that I still retain. In fact tomorrow I am spending the day with a friend I made at Robinson College - I am Godfather to her child and she was a witness at my wedding. That, of course, is the greatest legacy that most people have from going to university. It is a really special thing. I remember ringing my folks at home and saying that I couldn’t believe that I had landed there. Do you have any memories of the staff here at the time? I never really got the Boyne treatment while I was there, but he was certainly a formidable bulldog figure and we were all slightly intimidated by him, but I think I kept a sensible distance from him! that are only justifiable if you are really driven by a purpose. Is that not true in many professions where you have to work hard? It does seem to be constantly the same argument batted about and never really upheld anyway. And they keep making the same mistakes. I think that is why the Liberal Democrats were right to take a distinctive position on the Iraq war, and the MP expenses scandal where we are pushing for far greater reform than the others.We have always been very distinctive on civil liberties and the environment because I think people are crying out for something that is distinct and different, rather than the same old mush. Coming up to the next elections what do you think will be the most important policy or idea for you to focus on? I think that the central value will be fairness. Britain is still a woefully unfair society where you have an astonishing inequality of opportunity and those inequalities haven’t narrowed at all under Labour. So, for instance, we will constantly be banging on about fairer taxes. Cutting taxes for the vast majority of tax payers by raising the income tax threshold to £10,000 so no one pays income tax on the first £10,000 that they earn, paid for by asking the people at the top to pay a bit more. I think those kind of simple ideas in the wake of this recession is what we need to come out as a fairer and socially mobile society. I think it has real resonance for the moment and very much relates to where Labour has failed, where the Conservatives can’t be trusted and where I think we very much are pushing that progressive agenda. If you won by a landslide victory and were made Prime Minister what would be the first thing you would do? I think the first thing that I would do would give everybody the power to sack their MP if their MP had been found to be doing anything wrong. I think you need to do something quick and urgent, so that you give the people the sense that they are in charge and not these rotten politicians in Westminster. Telesuccess The 2009 telephone campaign raised a record amount to support College activities for resident members of College, thanks to the generosity of our members around the world and their families – thank you to everyone who took the time to speak to one of the student callers. The total committed to date is just under £151,000 and will allow the College to support students in their academic work and pastorally. Gifts will help us to maintain a suitable living and working environment for all resident members, to purchase books for the library and to support students who find themselves in financial need through no fault of their own, allowing them to focus their efforts on their academic work and to gain the maximum benefit from all that a Robinson and a Cambridge education and research base has to offer. This would be impossible without the support of you, our donors – thank you! If you made a pledge but have not yet been able to return your completed gift form, it is not too late to do so, please use the forms below and overleaf. GIFT AID DECLARATION - MAKING THE MOST OF YOUR GIFT - PLEASE FILL OUT THE FORM OVERLEAF Robinson College may reclaim the basic rate tax on all gifts, provided that you have paid an amount of UK Income Tax or Capital Gains Tax equal to the tax we reclaim. This means that every £10 donated is worth £12.80, and the difference is paid by Revenue and Customs, at no cost to you. Please pay Robinson College Direct Debits from the account detailed in this instruction subject to the safeguards assured by the Direct Debit Guarantee. I understand that this instruction may remain with Robinson College and, if so, details will be passed electronically to my Bank/Building Society. YOUR BANK OR BULDING SOCIETY DETAILS Name of Account: ___________________________________ Bank / Building Society: ___________________________ Account Number: __________________________________ Branch Sort Code: _______________________________ To (name of your Bank / Building Society): _______________________________________________________________ Address of your Bank / Building Society: _________________________________________________________________ Signature(s): ____________________________________________________ Date: ____________________________ Originator Identification Number: 412344 Reference number (FOR OFFICE USE ONLY): _______________________ THE DIRECT DEBIT GUARANTEE This guarantee should be detached and retained by the payee • This Guarantee is offered by all Banks and Building Societies that take part in the Direct Debit Scheme. The efficiency and security of the Scheme is monitored and protected by your own Bank or Building Society. • If the amounts to be paid or the payment dates change, Robinson College will notify you 10 working days in advance of your account being debited or as otherwise agreed. • If an error is made by Robinson College or your Bank or Building Society, you are guaranteed a full and immediate refund from your branch of the amount paid. • You can cancel a Direct Debit at any time by writing to your Bank or Building Society. Please also send a copy of your letter to us. GIFT AID DECLARATION - ROBINSON COLLEGE PLEASE TREAT (tick as appropriate): The enclosed gift of £_______________ as a Gift Aid donation; OR All gifts of money that I make today and in the future as Gift Aid donations; OR All gifts of money that I have made in the past 6 years and all future gifts of money that I make from the date of this declaration as Gift Aid donations. You must pay an amount of Income Tax and/or Capital Gains Tax for each tax year (6 April one year to 5 April the next) that is at least equal to the amount of tax that Robinson College will reclaim on your gifts for that tax year. DONOR’S DETAILS Title: _________ Initial(s): ________ Surname: __________________________________ Home address: ___________________________________________________________ _______________________________________________________________________ Postcode _______________________ Date: ___________________________________ Signature_____________________________ Email: _____________________________ Please notify Robinson College if you: 1. Want to cancel this declaration. 2. Change your name or home address. 3. No longer pay sufficient tax on your income and/or capital gains. Tax claimed by Robinson College 1. Robinson College will reclaim 28p of tax on every £1 you gave up to 5 April 2008. 2. Robinson College will reclaim 25p of tax on every £1 you give on or after 6 April 2008. 3. The Government will pay to Robinson College an additional 3p on every £1 you give between 6 April 2008 and 5 April 2011. This transitional relief for Robinson College does not affect your personal tax position. Evie demonstrates equipment to a local girl. other trees of cultural significance have been felled – and with animal numbers in steep decline it has become harder and harder for the Rimba to find enough food. For the second film we travelled to a remote village on the banks of Lake Sembuluh in Kalimantan (Indonesian Borneo). The villagers of Sembuluh are not as culturally isolated as the Orang Rimba – they are Muslim, and literacy figures are high – but this area is very remote, and at the forefront of palm oil expansion. Reaching Sembuluh village takes up to ten hours of driving, mostly on un-surfaced roads, and mostly through previously forested land that has been razed to the ground to build plantations (picture - middle right). The inaccessibility of this part of Borneo means there’s often a vast difference between the policies agreed upon by company executives and what’s actually happening on the ground. In both Sumatra and Kalimantan we asked people from the communities to testify on camera – directly to the companies involved – and to voice their concerns and worries for the future. We then screened these testimonies to representatives from the relevant companies, and they in turn were asked to respond on camera. The resulting films – Orang Rimba: Happiness Lies in the Forest and Sembuluh Voices: Stories from the Palm Oil Lake - can be viewed on the Films4Forests project’s dedicated website, along with masses of accompanying background information and longer interviews with the Orang Rimba: www.films4.org/forests. Working with the Orang Rimba and the Sembuluh villagers was both inspiring and felt like a privilege, but the Films4Forests project was not without its challenges. Gaining funding was a gargantuan task in itself. We were fortunate to receive some seed funding from a small charitable trust, and soon after had several major NGOs, including Oxfam and Greenpeace, on board. Other funders included the Dutch Lottery and Lush Cosmetics. Juggling the different interests of so many different sponsors was tricky at times, but having lots of different organisations involved has helped ensure that the films continue to have an impact and are still finding new audiences. In November 2007, Oxfam screened the Orang Rimba film to an audience of 500 of the most influential players in the international palm oil trade, coming from 28 countries – including Government ministers, heads of industry, finance, and retail – at the Roundtable on Sustainable Palm Oil (RSPO) in Kuala Lumpur. The film caused quite a furore, providing a reality check for investors who believe that membership of RSPO is enough to ensure sustainable palm oil and/or good press. The screening was also essential in providing the Orang Rimba – who cannot read or write but have a strong tradition of oral testimony – a voice within this forum. In late 2008, Nick and I made a return visit to the Orang Rimba, this time accompanied by a team from Lush. The Rimba and Lush spent a couple of days sharing their knowledge of sustainable sourcing, and discussing the potential outcomes of the credit crunch. Lush have since run fundraising campaigns across their stores internationally to help improve access to healthcare and education for the Orang Rimba in Jambi Province. As a result of the success of the project, we were awarded Conservation Filmmaker of the Year by Filmmakers for Conservation, and films4.org won the best new media award at the Wildlife Asia Film Festival. For most of 2008 Nick and I found ourselves back in Kalimantan, this time with a much bigger camera and a dedicated cameraman, directing and producing a Natural World and a 6-part series for the BBC. In 2005 we’d met an inspiring young Frenchman who goes by the name of Chanee (meaning gibbon in Thai), who’d moved to Borneo when he was 18 years old to open a gibbon sanctuary and radio station in the town of Palangkaraya. It was fairly apparent to us at the time that his charisma and enthusiasm, combined with his obvious dedication to what he was doing, would make good TV. Radio Gibbon – a one-hour programme for Natural World – focused primarily on Chanee’s gibbon sanctuary, and was screened on BBC2 last December. The six part series – Good Morning Kalimantan – focuses on Chanee’s unique radio station and sees Chanee getting to grips with some of Borneo’s most iconic species, including sun bears, proboscis monkeys, hornbills, and orangutans. Good Morning Kalimantan is due to air later this Spring and is narrated by Robinson alumnus Robert Webb (1992). Updates @ http:// bit.ly/radiogibbon. Ben Cole (Natural Sciences - Biological, 2005) talks about his passion in life and his road to becoming a professional photographer How I got into photography I got into photograpy in my second year in Robinson. My Mum and Dad bought me a Canon 350d digital slr for my birthday and I started out just taking photos of me and my mates messing around out in town and around College. Soon after that I discovered photoshop and began editing a lot of my images, staying up well into the early hours of the morning compiling albums that I would then upload on Facebook. People started telling me how much they liked them, and bolstered by their kind words I did more and more of it, until I became even more brilliant. I had a good friend, Debbie 'Napoleon Dynamite' Skywalker, from Newnham who was taking lots of photos for Varsity newspaper, and we would often go on little photography journeys out into fields and take each otherâ&#x20AC;&#x2122;s portraits. Then one day in exam term in my last year we were talking and realised we had no real ideas as to what we might do with our lives once we graduated (it wasn't that Robinson College hadn't given me lots of options or avenues, rather I hadn't given it enough thought!) and so we decided there and then to become professional freelance photographers, and so thatâ&#x20AC;&#x2122;s exactly what we did. How we did it We began by taking lots of pictures of our friends, who we thought might one day become famous. We guessed quite accurately, and we have so far worked with a lot of familiar faces from Cambridge, such as Joe Thomas who's now acting in The Inbetweeners, Jonny Sweet who's touring with his own one-man comedy show, and Ed Hastings who's touring the world with his singing voice. We also took Ruth Jones' headshots for Spotlight, and with all this material we set up our own website - www.roguephotography.com. We started taking a lot of photos at weddings as well, and have so far covered 12, with another 10 booked for later this year. What we do now We run the 'Rogue Photography' wedding and portraiture photography company, and have recently set up alongside that, a fine-art photography company, 'Cole and Scanlan' (www.coleandscanlan.com). We learnt early on that it's impossible to marry the two, since people who like our fine art portfolio get put off by happy wedding shots, and couples wanting to book us for their weddings get a bit weirded-out by nakedness in our fine art section. Day to day Life as a freelance photographer is extremely varied. In different quantities, we juggle going on shoots, editing in the office, setting up meetings with potential clients to show them our portfolio, networking, fundraising, visiting galleries, running stalls at wedding shows, harrassing famous people with interesting faces to take their portraits, buying props for future shoots, updating our website, preparing to write a blog, and counting our money to see if we can buy bigger, or smaller but better, cameras (a Leica M9 please). and the team, has restored the Sundial to its former glory. The Sundial is now back in the rose garden of Thorneycreek House. The team is responsible for keeping the College fabric and responding to maintenance requests on the same day as the request is made, wherever possible. We pride ourselves on the way in which we deal with work requests. In September 2009, the team responded to 249 requests for maintenance work, with almost all being completed within 24 hours of the request being made.We also tackle environmental issues by changing our light bulbs to low energy bulbs, monitoring water consumption and making appropriate changes wherever possible. We recently undertook a survey of the months November, December and January. Of 456 urgent and priority requests for repairs, 98% were completed on the same day: a statistic that I am very proud of. Gary - A lot of the work that we do is never really seen. For the moment, we have a programme of replacing all the fire escape doors at the top of the staircases, as they have all rotted because they get a lot of weather on them. We are probably about two-thirds through doing that, but nobody ever sees you doing it and nobody would be able to tell that you have been up there doing anything.You get up there while the students are out and it’s probably a day’s work to take the door off, put a new one on and all the metal work on it and everything and then you clear up and get out. I think it’s the same for all the blokes. We get in and do our work and probably no-one really realises what we are doing. Bill - The atmosphere within the team is always buoyant and humorous, with each member being prepared to help and support each other, as well as working with other teams in the College such as the Gardeners and those in IT and Housekeeping. Such support speaks volumes of all the departments and the College in general. Every strong building must have a strong foundation and I firmly believe that the College has this in abundance. Announcements Monty Lentile: 27 November 1934 - 16 November 2009 We were very sorry to hear that Monty Lentile, whom many Members will remember as a part-time Porter in the Lodge between 1995 and 2000, recently passed away at the age of 74. Claire Palmer (Robinson College Chef) and Tom Jeffery (Emmanuel College Chef) were married on 7 August 2009 at Emmanuel College Chapel, followed by a reception at Robinson. Josh and Thea Sherer (nĂŠe Lee), both 1998, are delighted to announce the birth of their son, Barnaby Franklin, on 31 December 2009. James Radcliffe (1995) and Katie Owen were married on 13 September 2008 in Cherington, Warwickshire. Rebecca Bowtell (2002) married Tim White (of Barts and the London Medical School) in Poplar, London on 4 September, in a rare window of sun. Rebecca Williams (Law Fellow 2001-2005) and John Armour (Law Fellow, Trinity Hall 20022007) are delighted to announce the birth of their daughter, Ellanorah Grace Armour, on 14 September 2009. Neil Maurice (2001) married Saranne Book on 8 February 2009 in Jerusalem, Israel. They are now living in Finchley, London and Neil works as a Chartered Accountant specialising in advising financial institutions at BDO LLP. Announcements Paul Eden (1992) and Freddie Eden (nĂŠe Mulliner 1992) had a baby boy, Thomas Matthew, on 14 June 2009, seen here with his brother, Daniel. John Williams, Professor of Engineering Tribology, was awarded the prestigious Donald Julius Groen Prize by the Institution of Mechanical Engineers (picture left). On 31 August 2008, Olivia Gordon (1997) married Dr. Philip Clark, a musician and writer, at Somerville College, Oxford. Two of their bridesmaids were Robinson alumni Rosalind Brown (1997) and Chloe HoustonMandy (1997), at whose wedding in July 2008 Olivia and Rosalind were bridesmaids. Olivia and Phil were also joined on the day by other Robinson friends, Zoe Green, Alisa Pomeroy, Will Mandy (all 1996) and Catrina Davies (1997). Ben Crewe (1993) recently published his book The Prisoner Society: Power, Adaptation and Social Life in an English Prison - picture left (Clarendon Studies in Criminology).